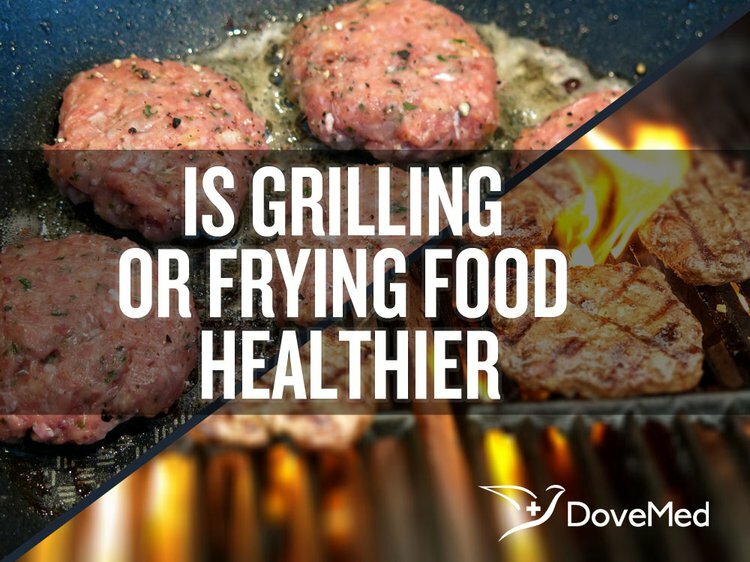 Is Grilling Or Frying Food Healthier? In analysis of the benefits and negative health consequences of grilling versus frying foods, they both have potential cancer-causing chemical hazards associated with them. In terms of their fat content, frying adds a considerable amount of fat to foods in comparison to the ‘little to no fat’ necessary for grilling. Whether you are a health fanatic or just taking small measures to improve your well-being or body composition, it is helpful to be informed of the various, healthy ways to cook your meat, seafood, and vegetables. It might not be common knowledge to know the different health effects between grilling and frying your food. Grilling and frying methods have considerable distinctions between them with sizable health consequences that you need to consider. Grilling exposes foods to intense direct heat and gives distinct flavors to foods, which is not achieved through other cooking methods. The grill bars sear the surface of the food, creating a flavorful crusty texture on the outside, while keeping the food moist and tender on the inside. Grilled meats tend to be a healthier cooking method because fat is able to drip away, leaving less fat on the food itself. This healthy cooking method best captures the flavor without the need for adding excessive amounts of fat, salt, marinades, or sauces, thereby reducing your caloric intake. Vegetables retain more vitamins and minerals when grilled. Grilled meats retain more riboflavin, a B vitamin that is important for body growth and red blood cell production, as well as thiamine, another B vitamin that is essential to most body systems. Despite these encouraging benefits, some research suggests that cooking meats at high temperatures, such as on the grill, creates chemicals that may potentially increase cancer risk. The University of Minnesota, School of Public Health issued a study in 2012 that assessed the association between high-temperature cooked meat intake and pancreatic cancer, which had been previously suggested in older studies. The results indicated that consuming well-done meat cooked at high temperatures, in which the meat contained high mutagen levels, seemed to confer heightened risk of pancreatic cancer by up to 60%. Chemicals, known as heterocyclic amines, are produced by the burning of amino acids and other substances in meat that is cooked to well done at high temperatures. This research, however, should not deter you from grilling. With the right technique and sensible foods, you can help avoid this risk. The American Cancer Society suggests cooking at lower temperatures. Choosing lean cuts of meat and trimming excess fat prevents fat dripping onto the hot coals of the grill, resulting in less smoke produced that contains possible carcinogens. Lining the grill with foil and putting small holes into it so fat still drip off allows the smoke coming back onto the meat to be reduced. The society recommends not charring meats or consuming portions that are burnt or black, as those have the largest amount of heterocyclic amines. Vegetables are great grill food, as many of these chemicals are not formed when grilled. Three types of frying exist which are dependent on the amount of fat or oil required, the cooking time, and the material of the cooking pans. Shallow-frying: A large, shallow pan is filled with fat that is enough to cover approximately 1/3 of the food that is being fried. The fat in the pan is first heated; food is then added and cooked for a few minutes. Once the food is removed, it is drained. According to the National Cancer Institute, researchers have found that high consumption of well-done, fried, or barbecued meats were associated with an increased risk of colorectal, pancreatic, and prostate cancer. Numerous studies have speculated this increased risk to be associated with the release of chemicals, known as polycyclic aromatic compounds (PAHs) and heterocyclic amines. These compounds are released when pan frying or grilling in conditions of high heat over an open flame for a long cooking duration. When frying, oil can cause smoke to be produced and result in the release of PAHs. Frying meat in over-used cooking oil will both affect the taste of your food product and result in the creation of PAHs. The European Food Safety Authority has recognized these compounds as a health concern and advises that oils should be clean when frying foods. Make sure to discard oil that gives off an unpleasant odor, trim fat from meats, and lower temperatures if smoking occurs. In analysis of the benefits and negative health consequences of grilling versus frying foods, they both have potential cancer-causing chemical hazards associated with them. In terms of their fat content, frying adds a considerable amount of fat to foods in comparison to the ‘little to no fat’ necessary for grilling. Although healthy fats are essential in our diets, there are other healthy ways to incorporate them into our diet besides frying. Out of all three frying methods, stir-frying is the most healthy, as it requires the smallest amount of added fat. Next time you visit a restaurant or need to make a decision on how to cook your food, consider grilling as your preferred cooking method. Consciously being aware of the factors that can influence hazardous chemical release and knowing the ways to prevent it will help you provide a healthy meals for your family. Erkan, N., Özden, Ö., & Selçuk, A. (2010). Effect of frying, grilling, and steaming on amino acid composition of marine fishes. Journal of medicinal food, 13(6), 1524-1531. Nothwehr, F., Snetselaar, L., Dawson, J. D., Hradek, C., & Sepulveda, M. (2010). Healthy option preferences of rural restaurant customers. Health promotion practice, 11(6), 828-836. Chilkov, N. (2012). The link between grilled foods and cancer. Huffington Post, 22.